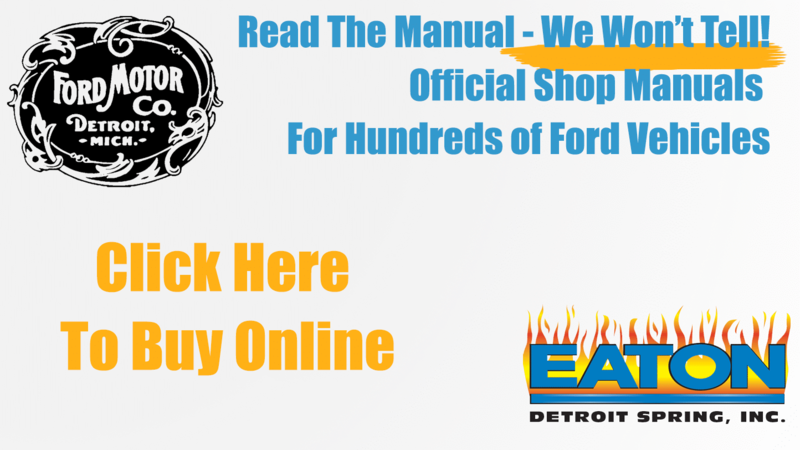 Hot Dog, you have the new springs from EATON Detroit Spring installed, now what? Hopefully the vehicle is 97.7% complete and sitting on the tires she will be riding on. Why 97.7% complete? Simple. Springs support weight, and all those parts not yet installed equal weight. We don’t get too concerned about minor things being missing, like the radio, mirrors, glove box door, etc. It’s the major items still not mounted. It’s the things like the engine, trans, body, and interior, just to name a few, that cause the problems. Remember, springs support weight. Missing weight equals no spring compression. No spring compression equals high stance. OK, now go take her for a drive, and do not baby her. Hit the gas, hit the brakes, find some good dips in the road. We like to say “Drive it like you stole it.” Put some miles on her. Once you have logged a few miles on your new suspension, come back to the garage and crawl underneath her. Take a good look at the new springs and everything else you put a wrench to when you changed the springs. Make sure everything still looks like it should. Look for looseness. Look for misalignments. Look for anything that does not look right. Now double check the tightness of all fasteners. Remember, torque only to the recommended specs. Tighter is NOT better. If your new springs were leaf springs we want you to pay very close attention to the U-Bolts. The weakest part of any leaf spring is where the center bolt goes through the leaves. The center bolt not only holds all the leaves together, the head of the bolt also aligns the spring to the axle. Any, and we mean any, looseness at the center bolt WILL CAUSE the spring to BREAK!!! If fact we do not warranty any spring that has breakage between the U-Bolts. Keeping movement out of the center of the spring by re-torquing the U-Bolt nuts every now and then will help extend the life of your leaf springs. For new coil springs, look to see if the ends are seated properly. I know, that can be tough on some vehicles, but those who have not seated correctly are pretty easy to spot. Make sure the shocks are not rubbing against the coils. And be sure the exhaust pipe is clear of all suspension parts. Now go out and have some fun while the weather is still cooperating.